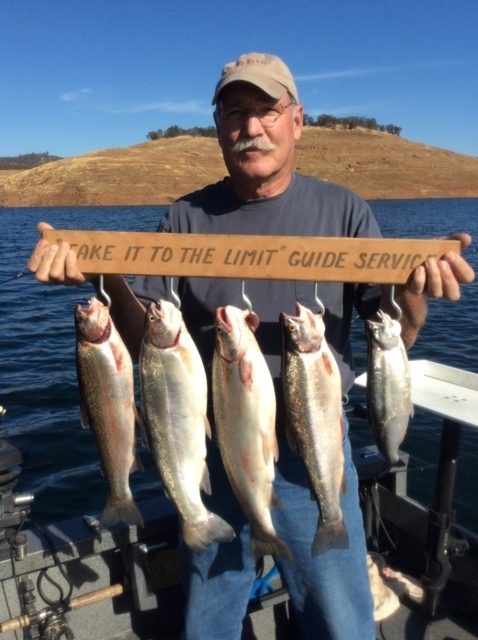 New Melones Lake is currently holding 510,632 acre-feet of water. The lake level dropped two feet this past week. It is currently at 860 ft. above sea level and 225 ft. from full. The water clarity is clear in most of the lake with a slight stain in some areas. The water temperature is slightly cooling, with the average being 61-66 degrees. The concrete ramp is CLOSED and is no longer in use. There is also a courtesy dock on the dirt launch which will be in place until the concrete ramp is open again. Michael Nelson and Rod Smith caught a very hefty five fish limit. Their largest weighed 3-pounds, 6-ounces and all five fish combined weight exceeded 15-pounds. The recent rainfall, shorter days and cooler weather have brought the lake temperature down to the low 60's. Generally the lake will start to turnover once the surface temperature reaches 56-degrees. We expect this to happen during the middle of November depending on weather conditions. Trolling anglers have been catching some large 3 to 5-pound rainbow trout while trolling over deep water. As the surface temperature cools, these fish will move up in the water column. Try trolling large spoons and brightly painted Rapalas down to 100'. Trolling at a faster speed should also help trigger strikes. Bank anglers should hit the shoreline and soak some bait. Rainbow garlic Power Bait is a good choice for bait, or a nightcrawler/mallow combo will work well. While your bait soaks try casting spoons and retrieving them near the surface. This is a great way to catch some of the active fish that have moved to shallow water. Glory Hole Sports Big Fish of the Week goes to Mario Lopez. He caught a 4-pound, 5-ounce rainbow trout while trolling a shad patterned Apex in 105' of water. We do encourage catch and release of brown trout, as there does not seem to be a large population of them in the lake. Carefully measure, weigh and photograph trophy fish and send us pictures and information. Rod Smith and Michael Nelson spent another day trolling spoons and plugs in deep water. Their biggest fish was just shy of 4-pounds. The season has come to an end and the kokanee will be spawning in the creek channels and upriver. The bass bite is slowly improving and anglers are catching a few more fish on each outing. With the recent rainfall and dropping water temperatures the bass should start to become more active. The fall bite on New Melones is usually awesome. It is a good time to catch a ton of fish and occasionally a giant. The lake is full of shad and most of the spotted bass are schooled up and hunting them in wolf packs. The shad have been holding in deep water and will start to move shallow, the bass will follow. Try using shad patterned lures that can be fished at multiple depths. A small swimbait fished on a jig head can be used to target fish that are holding in deep or shallow water. As you work down the bank, keep a close eye on your electronics. Look for bait and schools of feeding fish. Once located, use a vertical presentation. A jigging spoon and a drop-shot are both good choices for this style of fishing. Small spoons can be lowered to the depth the fish are holding and a lift/flutter action will trigger strikes. Try adding a feathered treble to further increase the action. PLEASE PRACTICE CATCH AND RELEASE. Take photos and carefully release the fish back into to the lake to maintain a healthy fish population for generations to come. 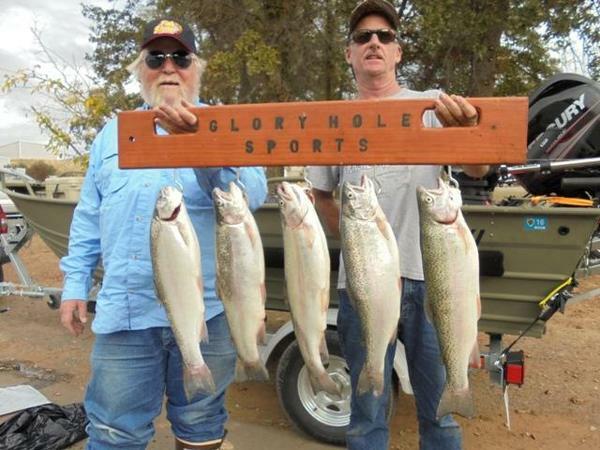 Glory Hole Sports Fall Catfish Contest starts on November 1st. We still have some openings and it will be going for the entire month of November. We have a $25 dollar gas card for the first catfish over 8-pounds. We are very excited to see some of those giant New Melones catfish. We are giving away over $300 in raffle prizes, plus the entry fees will be paid back to the top three anglers. This is a great time to target the largest catfish in the lake. They will move shallow and feed heavily in preparation for the colder winter months. Many different baits and presentations will work well. Frozen fish is always a good choice and some big fish are caught on it each year. Try using mackerel, anchovies and frozen shad. A weight-less approach often works best when fishing with frozen fish bait. Use enough bait to make a cast and let it fall slowly to the bottom. Chicken liver and nightcrawlers are hard to beat. Many anglers will soak their bait with Mike's Lunker Lotion, Berkley Catfish Attractant or Pro Cure. Catfish have very poor eyesight and will feed primarily by smell. Use Miracle Thread to keep your bait secured on the hook. Catfish can be caught near standing timber, large rock piles, points, humps and creek channels. Try many different areas and depths until you locate a catfish hang out. The crappie bite has slowed, but a few anglers have reported catching some nice 2-pound slab. They will be holding in tall standing timber near deep water and feeding on schools of shad that swim past. Mini jigs fish under a slip-float will work. Try fishing near the mouth of any of the major creek channels. As the water temperatures cool the crappie will school up and start to feed heavily on the shad that are migrating into creek channels. Follow the bait and the crappie will be nearby.